OTTAWA & MONTREAL, Canada – November 27, 2018 – BluWave-ai announces that it has raised more than $1M from several international angel investors and institutional investors, including the Ecofuel Fund, as part of a pre-seed round. This will enable BluWave-ai to implement its visionary strategy of optimizing energy efficiency in smartgrids using artificial intelligence. 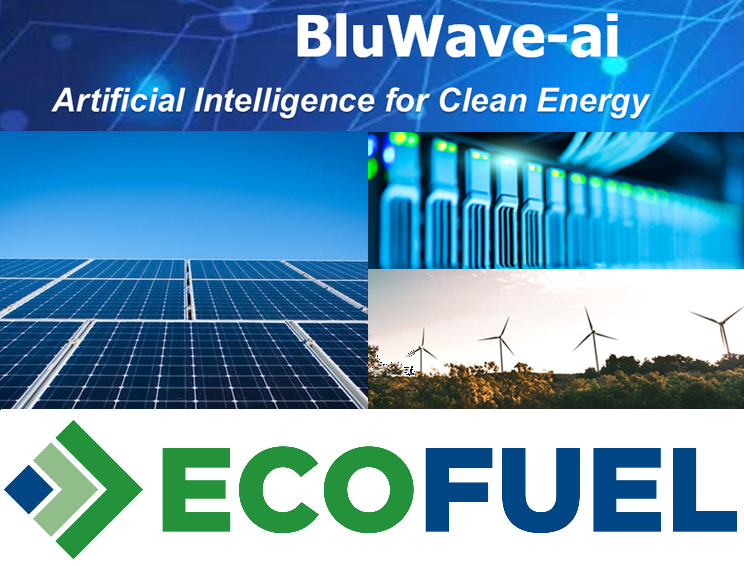 BluWave-ai has also been selected by the Ecofuel Accelerator as part of their Fall 2018 Cohort. Ecofuel enables some of the most promising Canadian start-ups with a path to large scale-out and significant GHG Emissions reductions to mature their business on all fronts from technical, IP protection, market, sales channels, and corporate management to excel in global markets. BluWave-ai’s solution consists of components at the edge and cloud data center which can be licensed with a SaaS model. BluWave-ai Edge is installed at the aggregation points of IoT sensors, meters, and other sources of data. BluWave-ai Center machine learning runs in either the private data center or public cloud, securely collecting data from Edge nodes to train AI models and coordinate functions between multiple BluWave-ai Edge locations. It includes an ensemble of machine learning and statistical techniques that discover patterns in data, performing predictive analysis and pattern recognition in real-time. AI models include wind, solar, battery state-of-charge, load, and energy market pricing. BluWave-ai was founded to optimize renewable energy usage with Artificial Intelligence (AI) in smart grids and microgrids. We are using our expertise in big data, AI, supercomputing, and distributed edge computing to positively impact how our planet uses clean renewable energy sources. BluWave-ai’s products manage loads and distributed clean energy sources in real-time to make optimal allocations. BluWave-ai ingests large data sets, applies AI, and optimizes system decisions in both energy and pricing contexts. BluWave-ai’s leadership and technical team consists of industry leaders in distributed computing, smart grids, artificial intelligence, and data science who are working together to make a greener future for our customers. Ecofuel is a venture capital fund and a specialized and personalized accelerator dedicated to the cleantech startups. Ecofuel, powered by Cycle Capital, works with entrepreneurs to help build globally competitive companies. Ecofuel Fund invests smart money in seed stage startups that develop and commercializes clean technologies while the Ecofuel Accelerator offers entrepreneurs a specialized and personalized program of training workshops, networking sessions, an experienced mentor ecosystem. In addition to the funding provided by the Government of Quebec, the Ecofuel Accelerator benefits from the collaboration of Transition énergétique Québec, Écotech Québec and Innovacorp.